There are many reasons why David Shaffer, M.D., surgical director of the Kidney Transplantation Program at Vanderbilt University Medical Center, loves his job. Some of them are tucked away in his desk drawer. “These are the things that really keep me going,” said Shaffer, reaching into his stash of thank you cards, notes and correspondence. “The patients send cards thanking me for their excellent care. Each one of them has a personal note. Shaffer came to Vanderbilt in 2001 as the new chief of the Division of Kidney and Pancreas Transplantation, from Beth Israel Deaconess Medical Center in Boston. Over 10 years, he has bolstered what was already a top-rated program. Marked accomplishments all point to a pattern of growth — growth in the number of patient referrals, patients evaluated, listed and transplanted. All of this while maintaining superior outcomes and developing strong relationships with referring physicians. 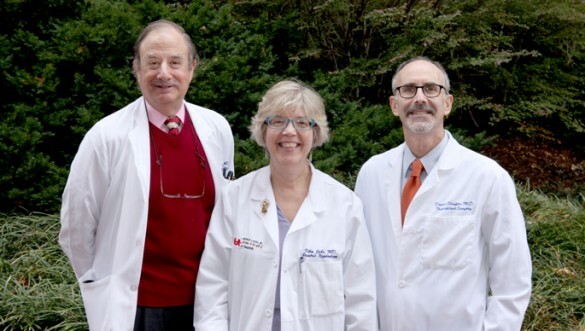 Although growth in the kidney transplant program has been pivotal, Shaffer’s focus on clinical excellence, introducing new surgical techniques, strengthening research components and expanding transplant options have also enriched the now 50-year-old program. Shaffer’s plans call for him to continue pointing the Kidney/Pancreas Transplant Program, one of the largest living-donor kidney programs in the Southeast, in the right direction and one that highlights the need for continuous quality improvement. But he admits that the journey will be challenging, not just at Vanderbilt, but for all transplant centers. “We are facing an older and sicker population that needs more complex care, a dwindling supply of donor organs and a much more complicated regulatory environment with an ever-heightened scrutiny by regulators and payers to provide improved care for reduced costs,” said Shaffer. “It is a complicated process, but we will continue to move forward and improve our process and outcomes. “As we grew a lot over the last 10 years, we learned a lot. We are not finished learning. We are not finished improving. We are constantly reviewing each step of the process and looking for opportunities to make things better, safer, more cost effective and easier for patients and referring physicians. “The key is integrating a method of continuous quality improvement and not being afraid to question a process or outcome,” said Shaffer. In the years prior to Shaffer’s arrival, the kidney transplant program performed an average of 86 transplants annually. Today the number of transplants has more than doubled. In 2011 kidney transplant volume reached 209. Vanderbilt has performed more than 4,400 kidney transplants since the start of the program 50 years ago when the first adult kidney transplant at Vanderbilt was performed on Oct. 3, 1962. The first pediatric kidney transplant at Vanderbilt was done on May 29, 1963. A cadaver kidney was transplanted into a 17-year-old boy. The surgeons were H. William Scott, M.D., and Charles Zukoski, M.D. Rejection was not uncommon in the early days of transplantation. The patient’s kidney rejected at 14 days and the patient died at 26 days post-transplant. In 1965 Vanderbilt launched a chronic dialysis program followed by the opening of a histocompatibility-testing lab in 1968. It wasn’t until 1972 that the first living-related kidney transplant was done, followed in 1985 by the program’s first pancreas transplant. When Zukoski resigned, Robert Richie, M.D., was asked in 1971 to lead the kidney transplantation program. For 30 years, Richie, along with H. Keith Johnson, M.D., worked together to build one of the leading kidney transplant programs in the country. Helderman, along with Bill Frist, M.D., who would become U.S. Senate Majority Leader, created the Vanderbilt Transplant Center in 1989. In 1994, C. Wright Pinson, MBA, M.D., deputy vice chancellor for Health Affairs and CEO of the Vanderbilt Health System, succeeded Frist as the Transplant Center’s director and served in this role for 18 years. “We have been very fortunate to have such great leadership of our kidney transplant team for all 50 years,” said Pinson. In the last decade, Helderman has been instrumental in helping to boost education, research and outcomes. Now, Vanderbilt houses one of the premier training programs in the country. Both Shaffer and Helderman agree that continued focus on anti-rejection agents will play a key role in the long-term success of kidney transplantation with improved outcomes and the ability to minimize adverse side effects. Quality of life and long-term survival are two areas of focus for Kathy Jabs, M.D., medical director of the Pediatric Kidney Transplant Program at the Monroe Carell Jr. Children’s Hospital at Vanderbilt. In 2009, the pediatric program saw its largest volume of transplants with 10. So far in 2012, the program has performed nine transplants. Whether caring for pediatric or adult patients, the top priorities for the program continue to be quality, patient safety, outcomes and service, said Seth Karp, M.D., director of the Vanderbilt Transplant Center. For years, Vanderbilt’s transplant programs have been lauded for outcomes, patient care and leadership. Karp plans to further boost those components while continuing to grow the center into a world leader in patient care and translational research. He said that Shaffer, Helderman and Jabs have led by example as they steered their divisions through a multitude of challenges, integrated state-of-the-art advances to provide the finest care available and developed systems to ensure the continued success of the kidney transplant programs at Vanderbilt. On Nov. 15 the Vanderbilt Kidney/Pancreas Transplant Program will gather to celebrate 50 years of service. Shaffer, Helderman and Jabs will be recognized.